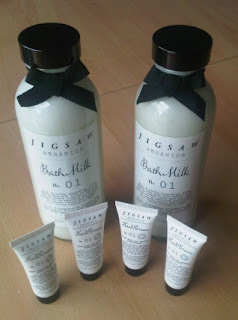 Jigsaw Organics was launched over 2 years ago and is available from their main website http://www.jigsaw-online.com/. The range, which is actually made in Devon, is formulated from organic ingredients and includes yummy things such a Aloe Vera, Shea Butter, almond oil and coconut oil to help soften and smooth the skin. I was recently ask to trial a couple of their products, and having never tried this range before was interested to see if they live up to the iconic Jigsaw brand name for quality!! A few days later i was sent this package below!! The first thing i have to comment on is the packaging, very cute old style labels with the instantly recognisable Jigsaw bow...simple yet very effective giving an overall look and feel that these are quality products. So first to the bathmilk. Now at RRP £25 this is definitely at the higher end of the market, however being part of the whole Jigsaw label i can understand the decision on price. It comes in a gorgeous glass bottle which would look fantastic on anyones bathroom shelf!! On opening you are immediately hit by very strong citrusy/woody aroma which i have to say knocked me back a bit, I'm not a huge lover of these woody type scents and i did find this hard to take in.....but my other half actually loved the fragrance, all down to personal taste i guess.... so i wouldn't knock it purely for that. So to the bath test. You simply pour the milk under running water. Firstly i was amazed at how quickly bubbles formed...my bath was full of them which was fab (I'm childish like that) and the room filled up with that heady aroma...which i have to say smelled much nicer and not as strong as directly from the bottle. Once in the bath you can actually feel your skin being almost enveloped in the milk which felt really nice..and that heady aroma had almost completely faded.....( i then relaxed for 20 mins....and had a wash... but you don't want to hear about that do you). Anyway post bath skin test.....my skin felt silky smooth, soft as a baby and overall really refreshed. Verdict: This is a nice product but for me I'm not sure it warrants the £25 price tag. Having said that, as bath milks go, its one of the better ones and i loved the way it made my skin feel after the bath.....my only negative...yes you guessed it....the smell, but that does calm down once in the bath. 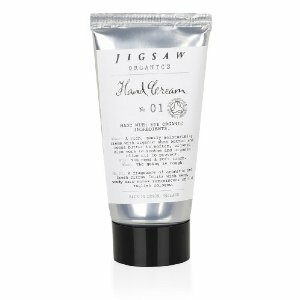 So onto the other product...the hand cream which is currently only available in a set with lip balm on the Jigsaw site. 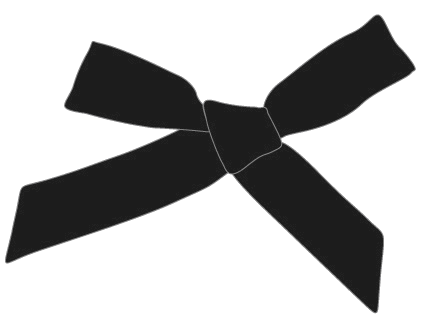 The picture below is a snapshot of the full size version. I use hand creams alot and i am always on the look out for that holy grail of hand cream, you know the sort..that actually keep your hands moisturised for longer than half an hour...so i had high hopes for this one. On opening i was greeted by that same citrusy/woody smell which i have to admit wasn't that bothered about this time as it was alot more subtle than the bathmilk. Onto the cream itself...on application the cream literally melts into your hands..so no furious rubbing like you do with some creams...your skin feels instantly re-hydrated, non greasy..so your not leaving paw marks everywhere...and the smell isn't overly powerful so full marks up to now. Does it last.......well yes it does.....my hands still felt great after a couple of hours, even my other half has got in on the act and actually nabbed a tube for himself as he found it worked well...and the skin on his hands are much worse than mine!! Verdict: I love it....out of the 2 products i was sent...this is the outright winner for me....such a fab handcream, love the way it just melted into my skin. Quite surprised they don't sell this on its own on the Jigsaw website but thankfully you can actually buy it on its own from Amazon RRP £11.50 and several other online retailers. Just found your blog on a list of local bloggers on the cdfblogs site, hello! Hey..nice to meet u...yeah only found the CDFblog site recently. You been to any of the meets?? ?